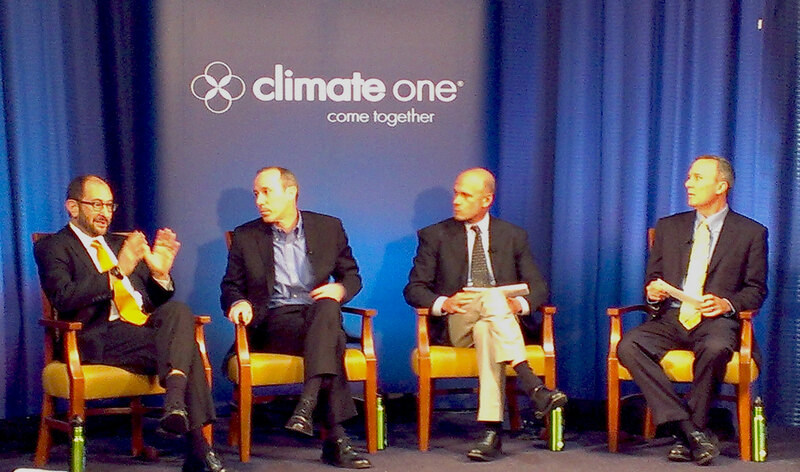 Cramer, O'Rourke, Brent, and Dalton discuss solutions to sustainable consumption during a Commonwealth Club Climate One panel. For years, the business community and consumers have debated the ills of greenwashing and benefits of product labels, but more recently that conversation has turned to sustainable consumption: What will it take to reduce the impacts of what we consume, and indeed to consume less? Support behavior change: A large part of addressing overconsumption requires delving into the complicated field of behavioral psychology. O’Rourke admitted that a service like GoodGuide is only a starting point. “Providing the scientific information alone about how we are screwed on climate change or biodiversity has almost no effect on behavior change,” he said. Instead, he suggested that companies consider ways that these issues do matter to people’s lives and expanding the conversation. For instance, if a mother is concerned about the toxicity in baby shampoo, she may start to consider chemicals in cleaning products. “We have found that even small, mundane consumption choices that change your perception about products or life decisions can be an entry point to a broader discussion,” O’Rourke said. For this reason, Dalton’s closing question to the group was perhaps the most important: How will you personally change your consumption patterns?